GAS.. is a simple accounting system of two levels account structure. It is not a full implementation of account system. The main purpose is complementing the Hotel Management System (HMS) operation. HMS operations generate accounts transaction. GAS.. defines account types like client, vendor, cash, bank, ... etc. and account entities for each account type. GAS.. enables users to enter and update account transactions for account entities. GAS.. also defines credit cards and follow up checks and credit cards. 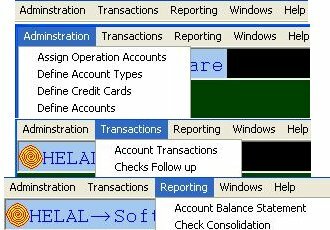 The enterprise operation systems (like HMS) post account transactions to designated accounts. For each account type the user has to define at least one account. At least the hotel clients must be defined but it is recommended to define banks and cash books. You have to define the account type and at least one of the accounts. As an example Client Account type and the name of at least one of the clients. Also you have to define different Credit Cards if you are going to use Credit Card Payment Method for bills. AUS: AUS Database (ausDb.mdb) and Module (aus.exe).